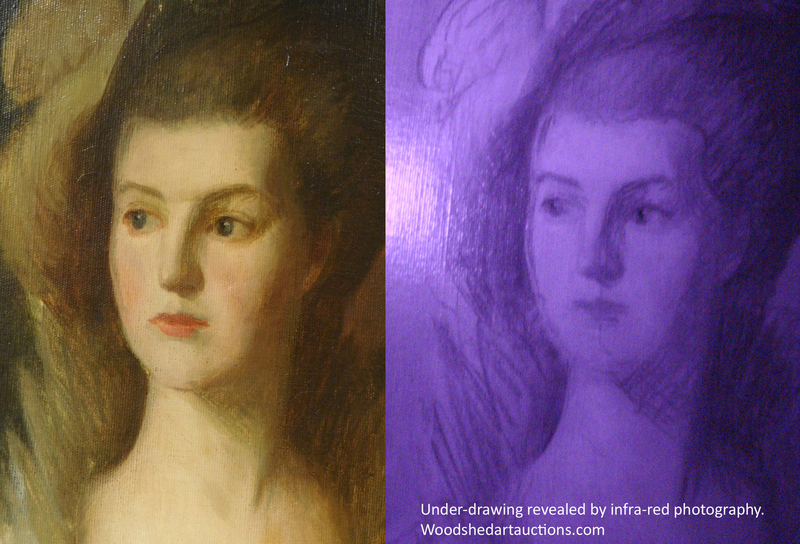 While examining an oil painting attributed to John Singer Sargent, I made a startling discovery. The painting, which is a study of the Porta Della Carta, Venice, is an unassuming view of the famous entrance to the Dodge’s palace. It fits within the type of scene Sargent was attracted to: Out of the way back alleys and doorways, stucco walls and finials, presenting an intimate view of the city, one that was certainly unrecognizable to most tourists. Although Sargent loved to use his friends and family as models in his Venetian paintings, this scene is devoid of figures. We (Jake Collins, Cataloguer for Woodshed Art Auctions, and I) wondered why. Infrared photography unearthed the fact that two figures were outlined and subsequently overpainted at the time of creation. 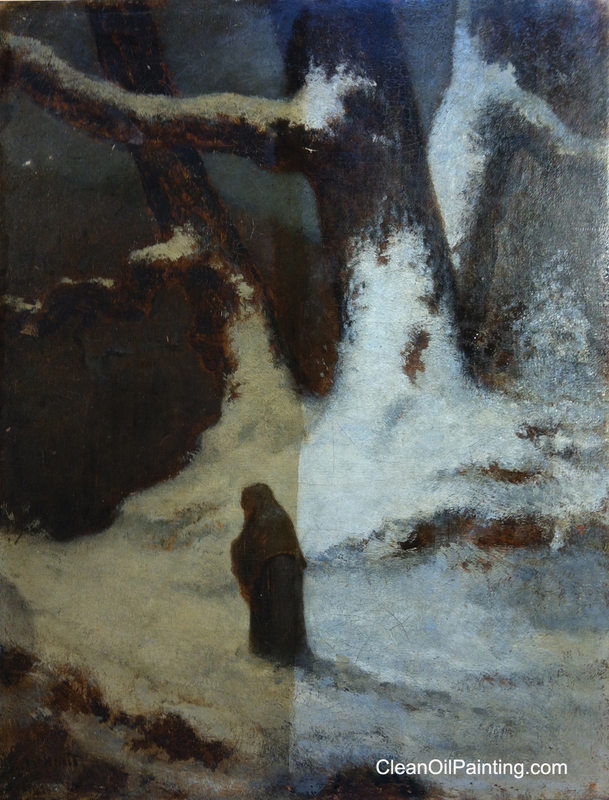 The under-painting shows a woman, possibly with a bustle, and another, unidentifiable figure, standing on the lower left-hand side of the painting, in the area that subsequently was altered to resemble deterioration on the wall. 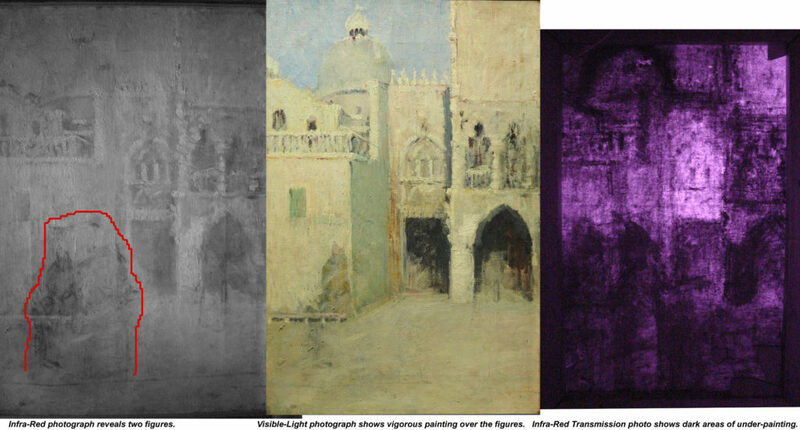 Infra-red photography shows figures which were originally planned into the painting. Jake Collins summarized the find: “Although the idea of eliminating figures in a composition may seem unusual, John Singer Sargent was a perfectionist who had no hesitation omitting elements he did find up to par. Sargent, arguably the premier portrait painter of his generation, believed that it was “..impossible to repaint a head where the understructure was wrong.” and would amend his paintings often when creating studies, only discarding the canvas when the changes became too apparent. Over the past few years, I’ve assembled a small arsenal of tools for forensic examination of paintings: Binocular microscope; ultraviolet and infra-red lighting; cameras to record those wavelengths; a near-infra-red (NIR) spectrometer and a laser-powered RAMAN spectrometer. Each tool has a different capacity for examining the materials used to create a painting, and now I feel like an art sleuth — ready for adventures in authentication! Study of The Honourable Mrs. Graham. The current blog post started a few years ago, with the acquisition of my infra-red camera. 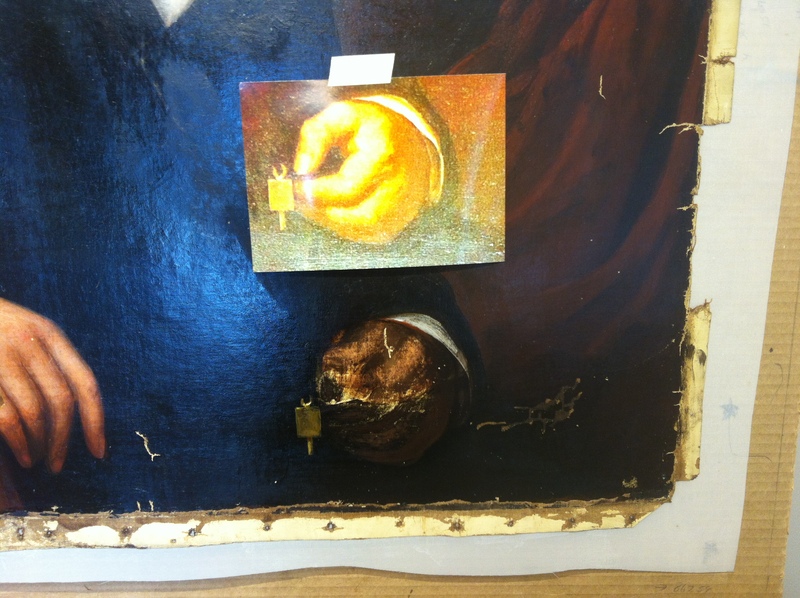 I used it to examine paintings arriving for restoration, but it often revealed nothing unusual. 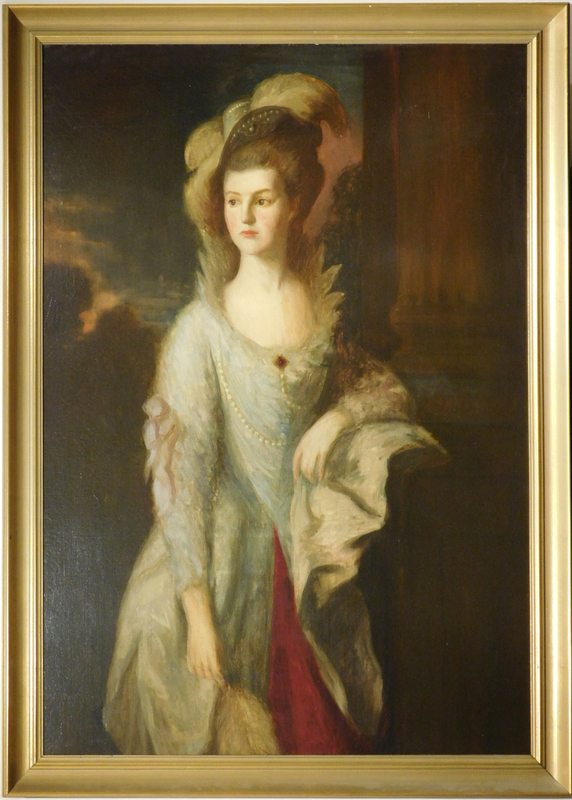 Until the arrival of what we thought was a copy of the most famous painting in Edinborough’s Scottish National Galleries: The Honourable Mrs Graham, a full-length portrait created by her admirer, Thomas Gainsborough. Looking into the screen of the infra-red camera was a magical experience. It revealed a complex and energetic drawing hidden beneath the surface of the paint. My excitement was hard to contain. This was Something! Examining the under-drawing and comparing it with Gainsborough’s drawing style, quickly led to the conclusion that the painting’s creation was a precursor to the SNG’s finished work. The discovery led to examination of another Gainsborough painting hanging in the Museum of Fine Arts in Boston, and eventually a trip to Edinborough to see their masterpiece and perform infra-red photography in their gallery. 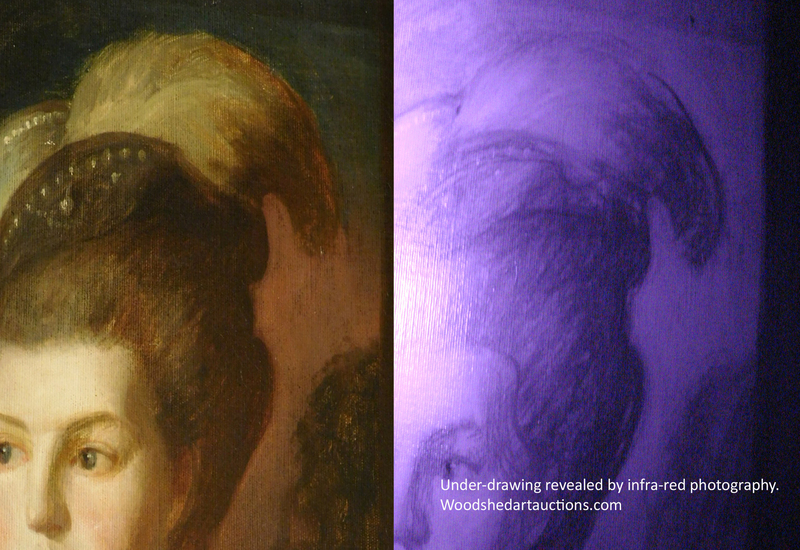 Infra-red photo (right) shows faint under-drawing on the face of Gainsborough’s portrait of The Honourable Mrs Graham, at the Scottish National Gallery.infra-red photography in their gallery. The revelations of this work led to an understanding of Gainsborough’s working methods, and further bolstered the opinion that the Woodshed’s painting is arare oil study by the master artist. The revelations of this investigation led to an understanding of Gainsborough’s working methods, and further bolstered the opinion that the Woodshed’s painting is a rare oil study by the master artist. 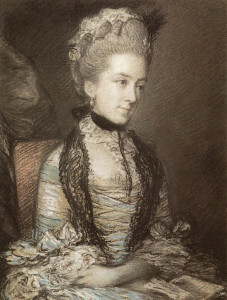 Gainsborough’s drawing of Portrait of Caroline, 4th Duchess of Marlborough, shows similar technique to that in the Woodshed’s study. Perhaps one of Thomas Gainsborough’s most intricate and recognizable compositions, Gainsborough’s portrait of the Honorable Mrs. Graham is one of the finest examples of 18th century portraiture. Equally as interesting, however, is the story of the sitter, Mrs. Graham, born Mary Cathcart, daughter of the Scottish ambassador to Russia. She spent her early years at the Court of Catherine the Great before her betrothal to Thomas Graham in 1774. 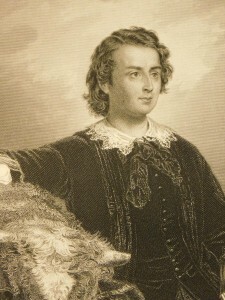 Although she maintained a life full of allegations of impropriety, including an alleged affair with Marie Antoinette, Graham was eternally enamored by his wife, going as far as riding ninety miles back to their residence, braving inclement weather to collect jewelry Mary had intended to wear to the ball that night but had forgotten. After her untimely death in 1792, unable to bear the sight of his beloved wife, he turned over ownership of the original Gainsborough painting over to her sister. 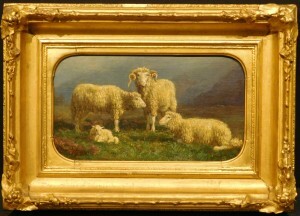 It was subsequently donated to the Scottish National Galleries by one of her sister’s heirs. 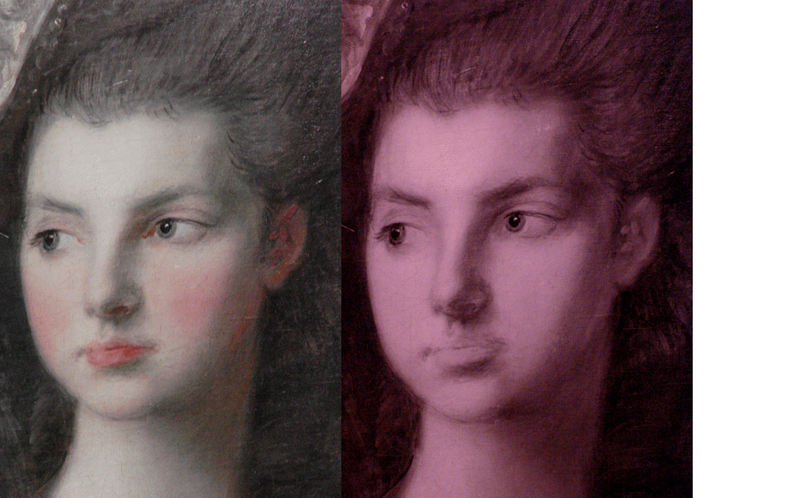 Infra-red photography (right) shows drawing under the paint. 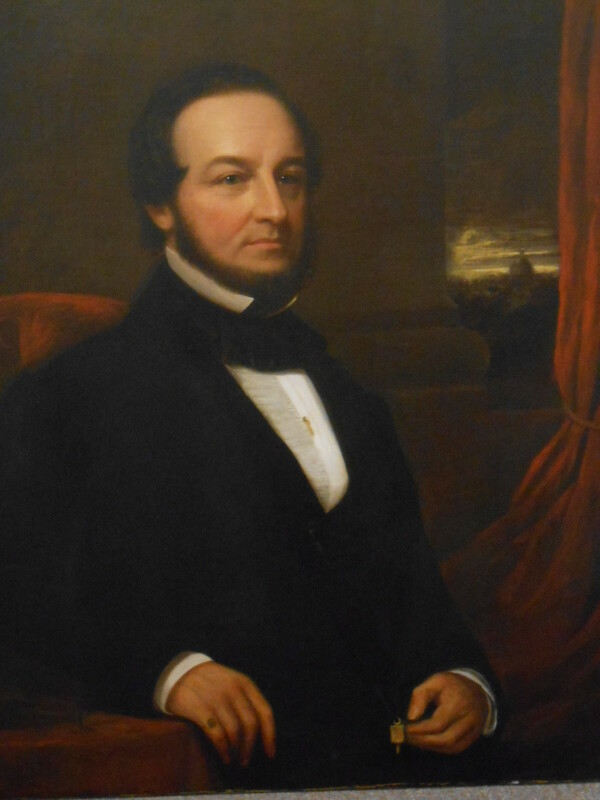 Thomas Graham, however, was not the only one infatuated by Mrs. Graham. 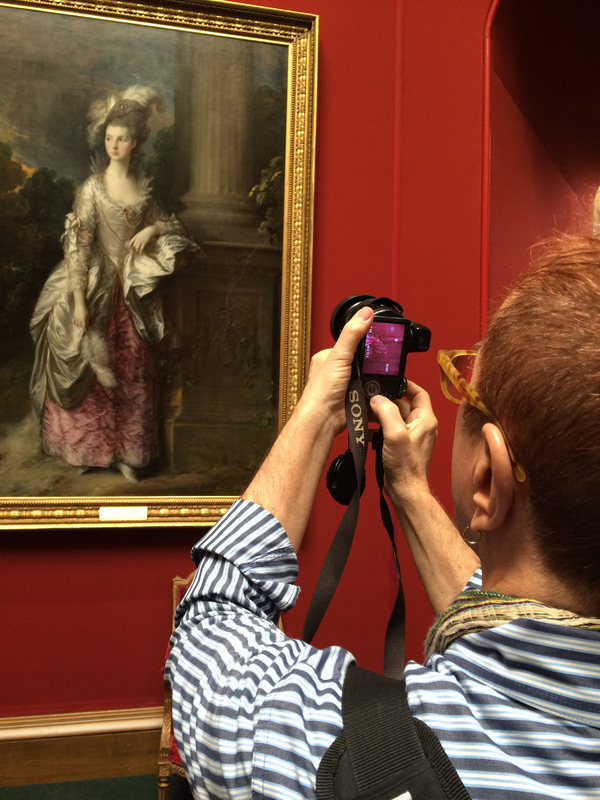 Thomas Gainsborough, too, was enamored by her presence and painted her multiple times, mostly from memory. Her striking beauty made her desirable to all and became one of the most admired women of her day, by both men and women alike. 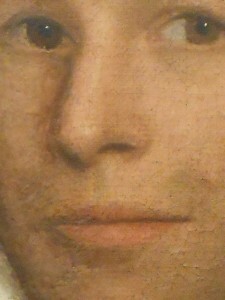 The variation in backgrounds is the clearest indication that this is perhaps a preparation sketch for the more intricate version that hangs in the Scottish National Gallery of Modern Art. Gainsborough solidified his position as one of the premier English painters, who dabbled in a variety of prominent styles during his illustrious career. While the exhibited version is a quintessential Gainsborough Rococo landscape, with an undulating, verdant hill and exquisitely rendered trees that would lay the groundwork for British Romanticism in the subsequent decades, this study maintains a more somber, yet equally as striking tone. The bucolic hillscape is replaced with a seemingly opaque mass of darkness capped by an eerie sunset, providing a stark contrast with the delicate, pale white Mrs. Graham rather than seamlessly integrating her into the composition. Although dissimilar from the version that now hangs in the Scottish National Gallery, the background is reminiscent of that in Gainsborough’s 1759 Self Portrait and adds a revolutionary dynamic to the formal, rigid rules for which eighteenth century portraiture is known. 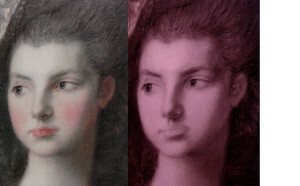 Infra-red photo (right) shows lightly drawn lines in the face & neck, with stronger marks in the hair of the painting in the Scottish National Gallery. 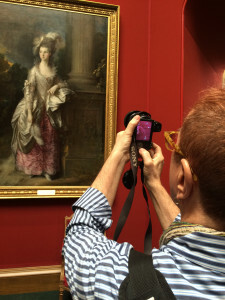 Gainsborough is regarded for his attention to even the most minute details when rendering textures in luxurious fabrics, jewels, hair, and accouterments, among other things. His hair is of particular note, eclipsing that of even his most notable contemporary, Sir Joshua Reynolds. Infrared technology has led to the discovery of how he rendered his sitters’ coiffures in such a dynamic manner- an underlying sketch in black chalk. When highlighted with paint, the quick, vertical strokes of black chalk add to the dynamism of the sitter’s fashionable updo and add depth to the static painting. This technique was peculiar enough to warrant further investigation from conservator Bruce Wood, who found nearly identical underdrawings on not only the version in Scotland but also on Gainsborough’s Haymaker and Sleeping Girl (late 1780s) at the Museum of Fine Arts, Boston. Gainsborough was particularly adept at drawing elegant hands, and this work is no exception. His hands extend from an already elongated wrist and terminate seamlessly into her gown. Although disproportionate, the elongated, clutching fingers only enhance the elegance of his sitters and, rather ironically, aim to pronounce the dainty features of his elite, sophisticated clientele. Photographing at the Scottish National Gallery with infra-red camera. While the Woodshed’s portrait is in exceptional condition, it does show signs of its age, furthering the idea that this is indeed a study by Gainsborough! 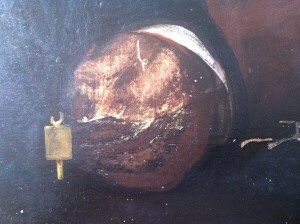 The manner of cracking is consistent with other portraits of the period, including both the version in the National Gallery and his compositions found at the Museum of Fine Arts. This piece is a technical masterpiece that only Gainsborough or someone equally as masterful could have painted, and it is, indeed, very likely that it was created by Gainsborough’s hands. Bruce Wood performing infra-red photography in Edinborough. 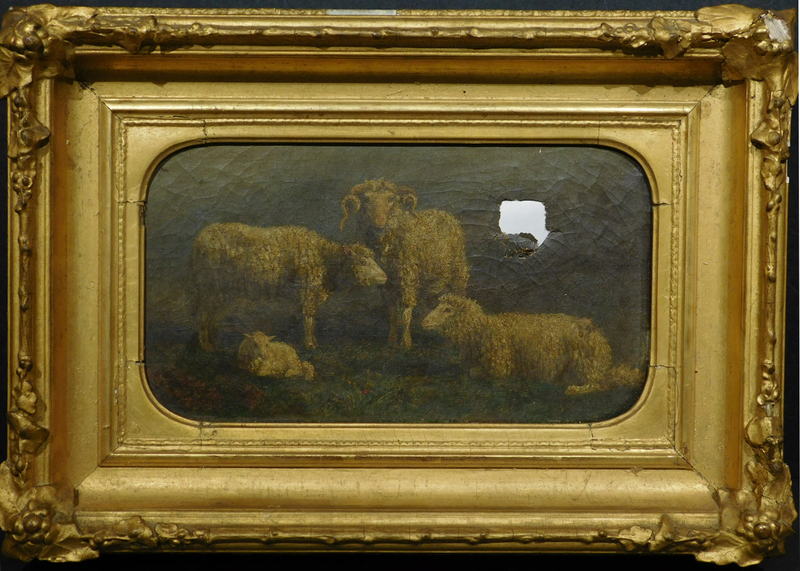 Recently I had the pleasure of restoring a little gem of a painting by Rosa Bonheur. The restoration involved several procedures which I’m often asked about, (Lining, facing, consolidating, patching) so I documented the work and made a video explaining what was done. The photos below show some highlights. 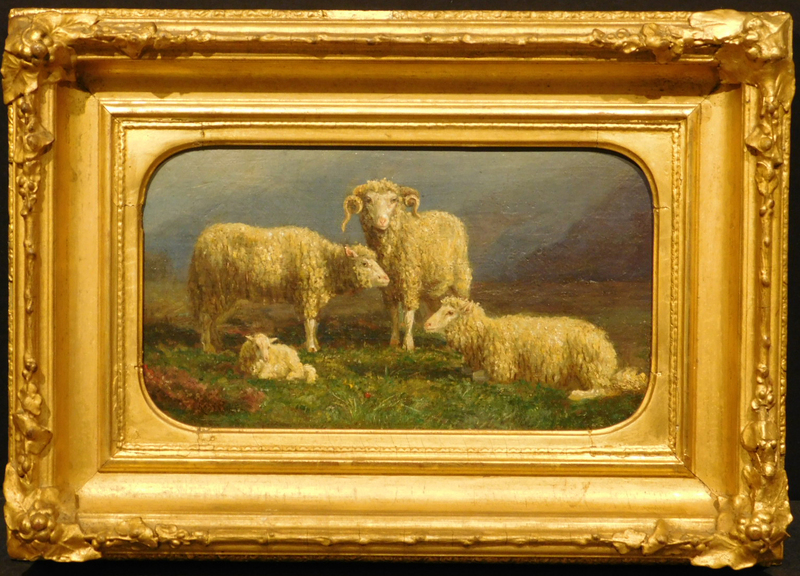 Rosa Bonheur, born Marie-Rosalie Bonheur, (16 March 1822 – 25 May 1899) was a French artist, an animalière (painter of animals) and sculptor, known for her artistic realism. The painting was brittle, filthy, and torn. Lining the canvas: This photo shows the materials used to create a new backing for the old canvas. It is a sandwich layer of polyester mesh, Mylar and polyester canvas. A heat-set adhesive is used to bond the layers together. One of my vacuum tables. The bottom is a heated sheet of aluminum. The top is flexible vinyl. Rosa’s painting is in position for laminating to its new backing. The facing paper can be seen on top. With the top closed, air is evacuated and heat turned on. 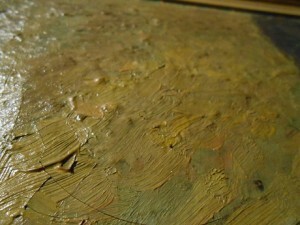 The vinyl top forms itself to the contours of the painting. 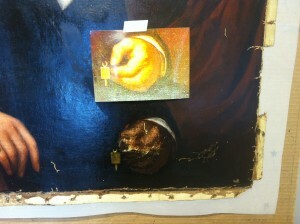 Once the painting is lined, it can withstand the rigors of handling, removing the facing paper and cleaning. Here, the painting is partially cleaned. 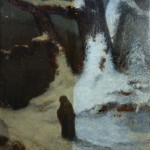 The white mesh of the new backing extends beyond the painting’s margins. When it comes to Tonalist paintings, the works of George Inness (American, 1825-1894) are considered masterworks of genius. 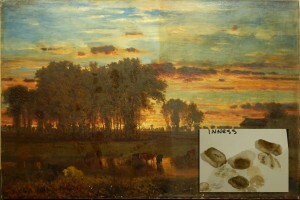 In his lifetime, Inness had notoriety and stature among the American Art Elite. His teachings and aesthetic continue to influence generations of artists, up to the present day. 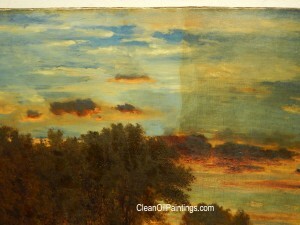 The George Inness painting as it looked when it arrived in my studio. 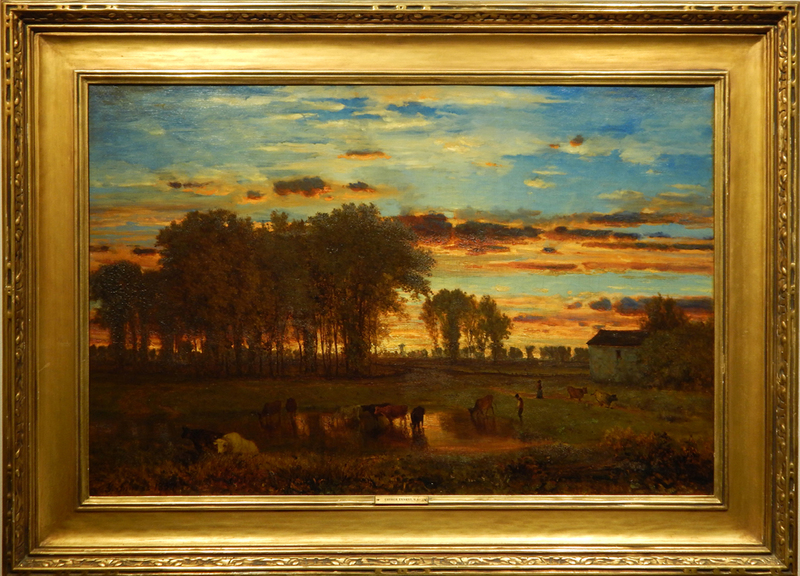 A few months ago, I was asked to appraise and clean a magnificent Inness Sunset painting. I was thrilled to examine it, following the pattern of brush work and glazes. The glazed areas were thick and granular from dried oils. 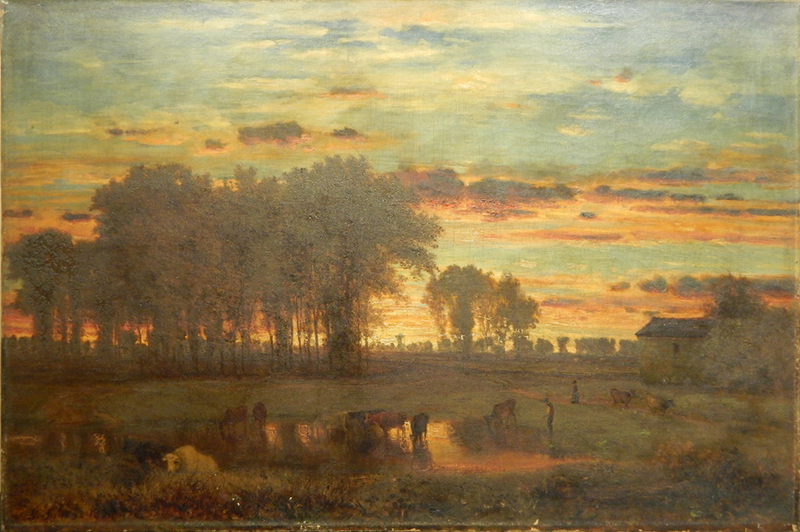 The once-bright sunset colors were muted from a heavy layer of soot and grime. 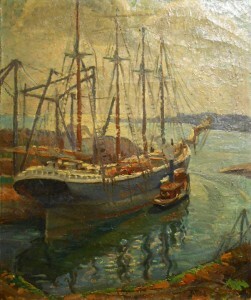 It looked like the painting had been restored about 75 years ago. 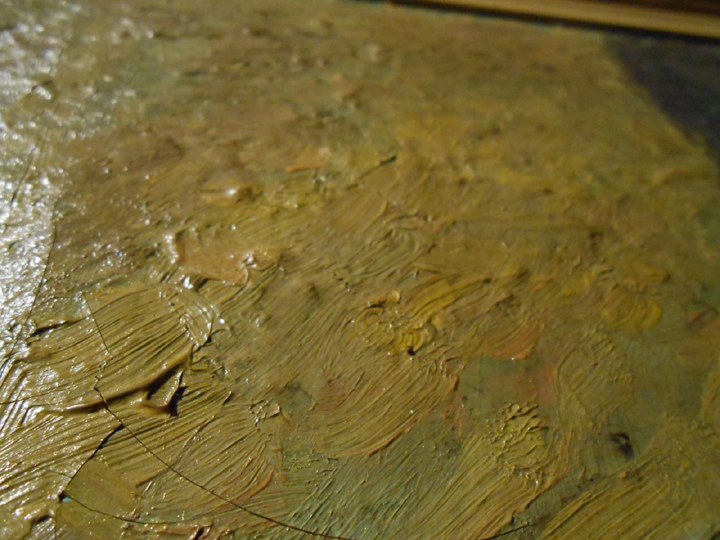 An old wax lining had stabilized heavy craquelure in the sky, and I found patches of old retouching. Partially cleaned painting. Cotton swabs (inset) show a record of the dirt and varnish which was removed. Other areas, especially the granular glazes over the trees, were fragile. To prevent them from dissolving from the normal varnish-removal fluids, those areas were cleaned with a mild solution. Finally, with the painting clean, and old retouching removed, a coating of non-yellowing varnish was applied. A few areas of in-painting were needed in the old retouch areas, and to tone down some of the under-painting which was revealed (as cracks) through some shrinking paint layers in the glazed trees. 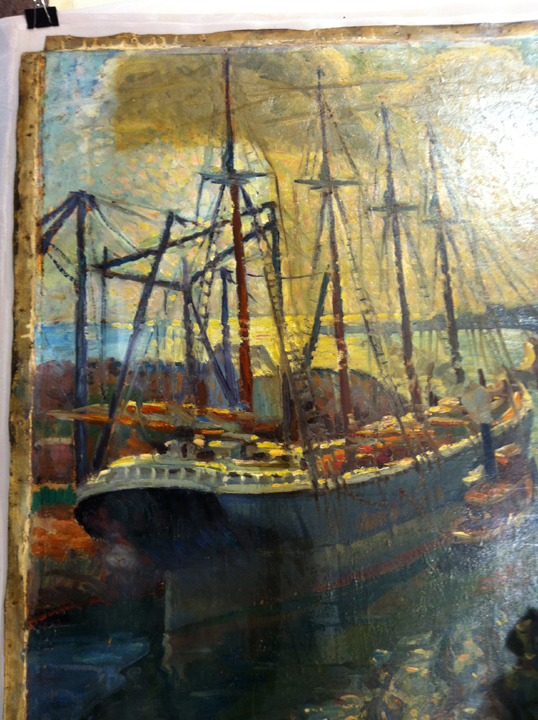 The final step in returning the painting to a semblance of its former glory was the application of two coatings of clear, non-yellowing varnish. The colors and details became vibrant and crisp. After installation back into its original frame, the result was quite satisfying. 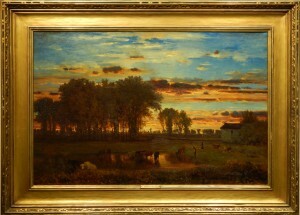 George Inness Sunset oil painting after cleaning. Last year I decided to become a sponsor of Antiques Roadshow on Rhode Island Public Broadcasting. That was the start of an amazingly symbiotic relationship! I’ve gone on to underwrite the Downton Abbey series, too. Recently the RIPBS Director of Development, Debby Hall, invited me to visit their Providence RI studio to record a short testimonial. Here it is! My idea of fun this summer was anticipating what new treasure would arrive at my studio next. I was not disappointed! The variety of paintings was totally fascinating. 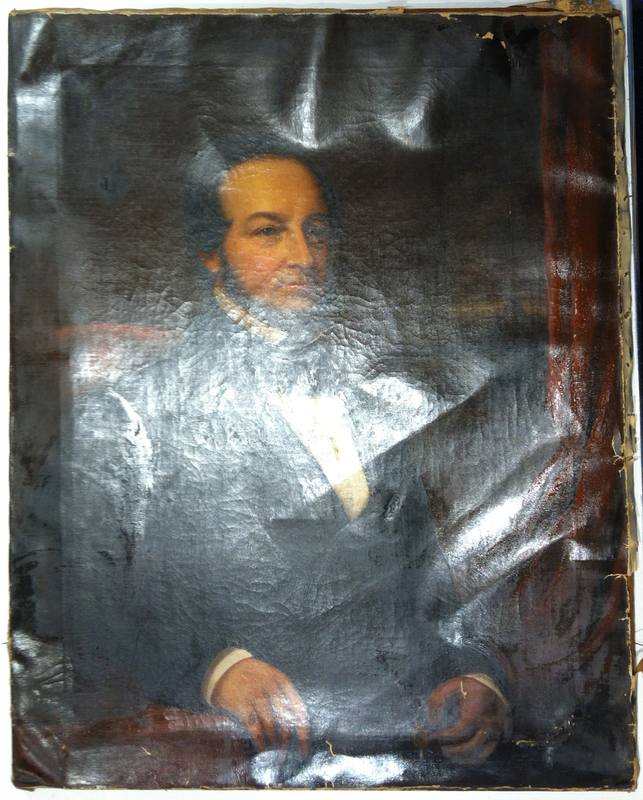 A call from New Hampshire resulted in the arrival of a rare painting by William Morris Hunt. It had been over a fireplace mantel since its creation in the mid 1800’s, and its winter moodiness was covered by a layer of grey. A Rhode Island collector presented a 19th Century continental landscape for cleaning, it’s minute details all obscured by the residue of cigarette smoke. An heir in Colorado sent two American 1880’s landscapes to be cleaned and repaired. A woman in Utah sent a ripped painting of a horse, and a Massachusetts couple arrived at the studio with a cavalry battle-scene painting in need of cleaning. And, apparently to balance-out my overly equine selection, a man from Connecticut brought a painting of cows. It’ was a fun summer! 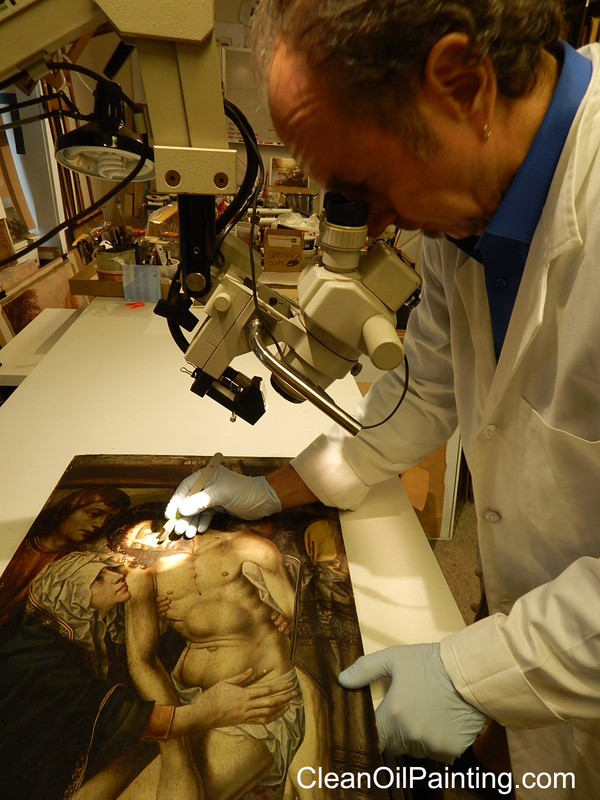 Examining and restoring a 17th Century French altar panel. 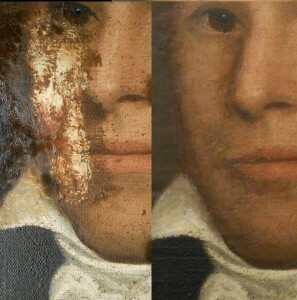 Early 1800’s portrait before and after restoration. 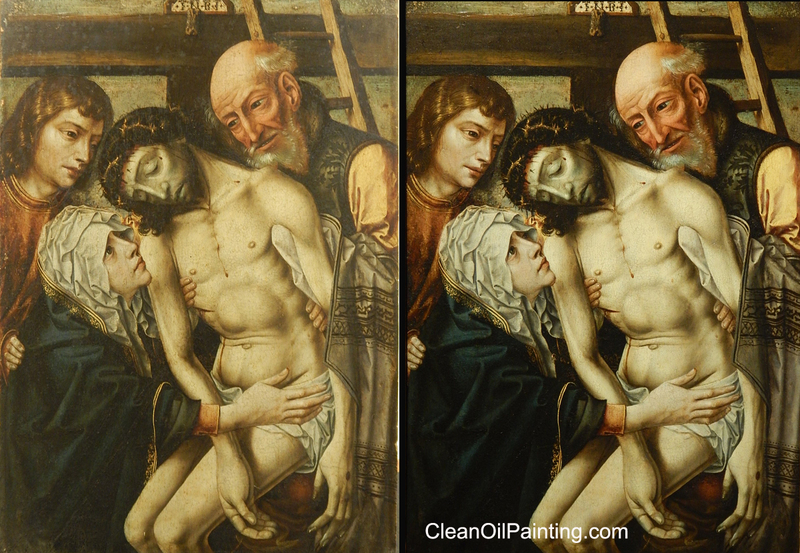 17th Century French altar panel before and after cleaning & partial restoration. 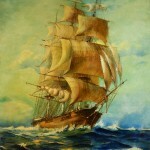 1940’s clipper ship painting, partially cleaned. 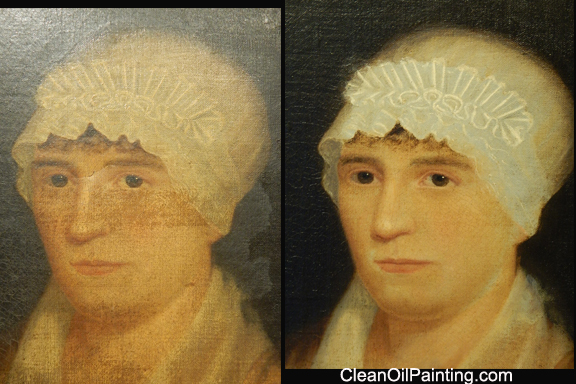 Mid-1800’s Anglo/Euro Painting, before and after cleaning. G.A. 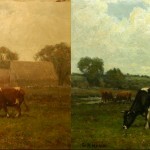 Hayes American landscape with cows, before and after cleaning. William Morris Hunt oil painting partially cleaned. 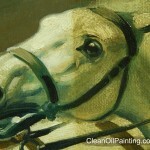 Painting of a horse, partially cleaned. 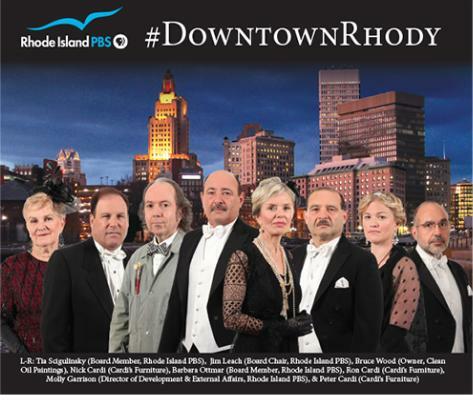 The illustrious cast of Downtown Rhody. Are you a Downton Abbey fan? I am, and along with the Cardi Brothers of Cardi’s Furniture, decided to sponsor the Rhode Island PBS Preview Screening of Downton Abbey. Pre-screening dinner party on stage at the Veterans Memorial Theater. 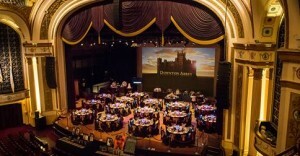 The event was held on December 6, 2014 in the magnificently restored Veterans Memorial Theater in Providence, with a fabulous on-stage dinner and an introduction to 1920’s costume design presented by Laurie brewer, Costume and Textiles Curator at the Rhode Island School of Design Museum. The screening was also preceded by an extraordinary rendition of “Downtown Rhody”, featuring The Cardi brothers and Yours Truly, along with a cast of RIPBS Celebrities. Enjoy our Rhode Island take on the Masterpiece hit! Some old paintings have a hidden history. 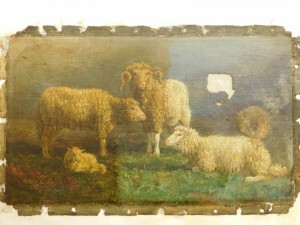 In the course of 200 years, a lot can happen to a painting, and it is rare to find one which has never required repair from some form of damage. This is the account of an oil portrait which had a few secrets. 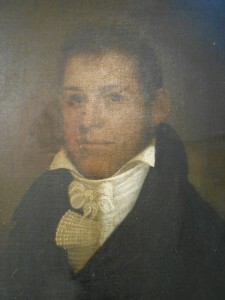 A few months ago I was asked to restore a portrait of Joel Prouty, a Massachusetts resident born in the late 1700’s. At first glance, it was obvious that painting was covered in layers of smoke, soot and grime, but there were no rips or holes in the canvas. However, something was wrong with the left side of his face. As I examined the area, I noticed an unusual cracking and surface texture from an old repair, and that the previous retouching was crude. When I turned the painting over to see the patch, I realized that the entire canvas had been lined onto a piece of linen, and by the look of it, the lining and repair were done about a hundred years ago! A UV light inspection revealed obvious retouching on the face, but the black background and soot hid any other areas of alteration. In evaluating my course of action, I determined to clean off all the soot, remove the old varnish and retouching, remove the patch and start the restoration with a new fresh surface. If needed, the existing lining would also be removed and replaced. When cleaning started, copious amounts of black grime were lifted from the surface. 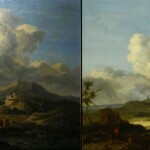 The background was revealed to be painted in a dark, muted green. A few spots resisted cleaning, and I soon realized that those spots were actually oil paint used in the previous restoration. 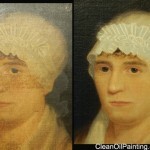 The restorer hadn’t cleaned the painting before retouching, and painted those areas by matching the color of the dirt! That discovery was a precursor to what I was to find when cleaning the face. You can see in the photos that most of the paint on the patched area came off. 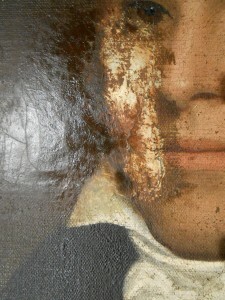 However, where the artist blended over into the undamaged face, the paint was well bonded to the original paint. It was very much darker than the cleaned area. In cleaning off the patch, it was revealed to be made of an old gesso formula which was in common use a century ago. It was harder than plaster, and had developed a few cracks, but was otherwise stable and firmly in place. I decided to repair the cracks with Acryloid B-72 (a glue used in sculpture repair) and then to re-level the patch with an acrylic filler. The lining appeared to still be in excellent condition, so it was left alone. As I continued cleaning into the lower background, large areas of black retouch paint started lifting off with the old dirt and varnish. That paint was covering some scrapes and water damage. 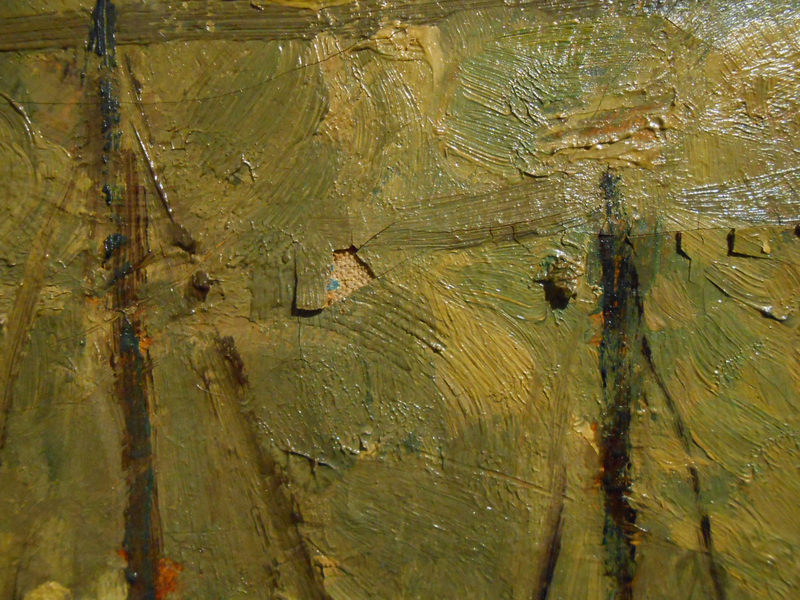 When I got to the lower left corner of the painting, I noticed bits of red appearing. 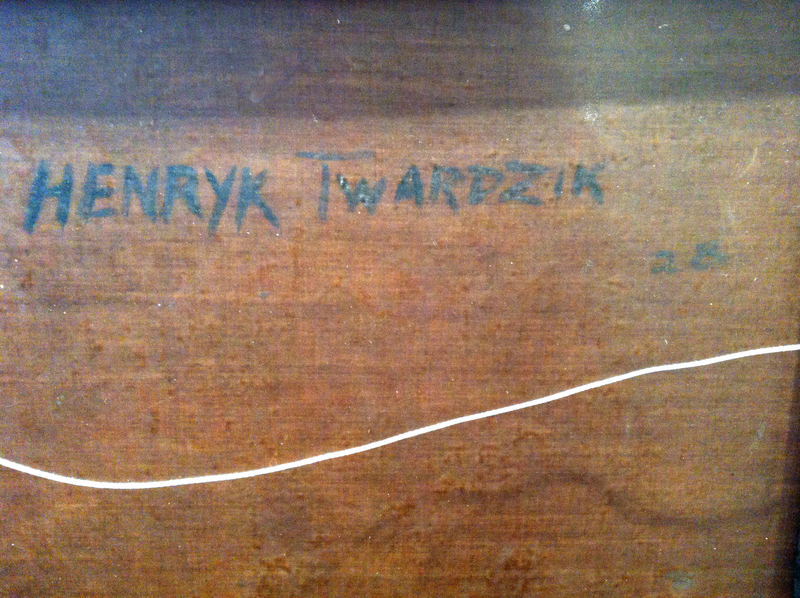 That turned out to be the artist’s signature! Unfortunately, the last few letters and the date below were partially missing, but enough was visible to determine that the artist was Ethan Allen Greenwood, a noted Boston portrait painter active at the turn of the 18th Century! Finding the signature was a thrill worthy of an Antiques Roadshow episode, but my excitement was tempered by the sight of the old patch covering what was once a large piece of missing canvas. The repair of that area was going to take a bit of inventiveness, not just to create half a face with no reference, but to do it in a way that matched the qualities of the 200 year old surface around it. 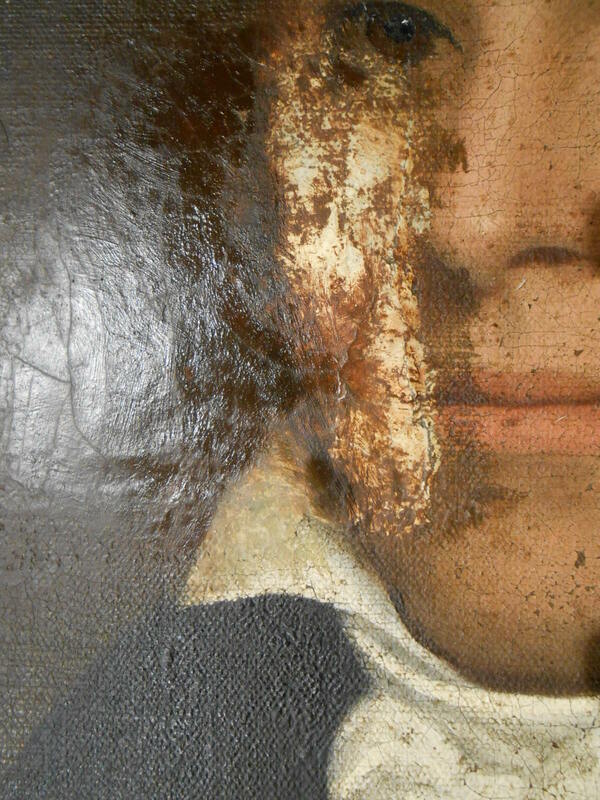 The face showed craquelure, and also a myriad of small flecks of missing paint. Painting over the entire face was an unacceptable solution (I want to keep as much original paint showing as possible) so I painstakingly in-painted the worst of the paint-pits. To replicate the complex surface of the original side, I decided to paint over the patch in a manner which had the visual qualities of the original side, but not the same texture. The result is an almost pointillistic interpretation of the face, which blends well with the original area. A lot of 19th Century portraits arrive at my studio. Often they are suffering from aged canvas and a good coating of soot. Sometimes they have holes in them, lifting paint from water damage, and lots of distracting craquelure. Recently I was asked to restore a portrait of Massachusetts Governor John Clifford (1853). It had almost every kind of damage except fire. The canvas was rotted and weak: it had fallen out of its frame. 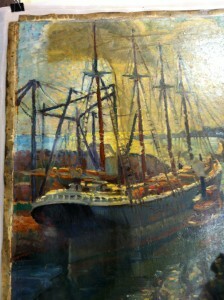 At some point in the past, it suffered water damage which lifted quite a bit of paint. There were a few small rips. Grime was covering everything. And it had undergone an amateur bit of retouching which left the Governor with a grotesque claw-like hand. I thought the poor man was victim of a stroke! The portrait as it arrived in my studio. 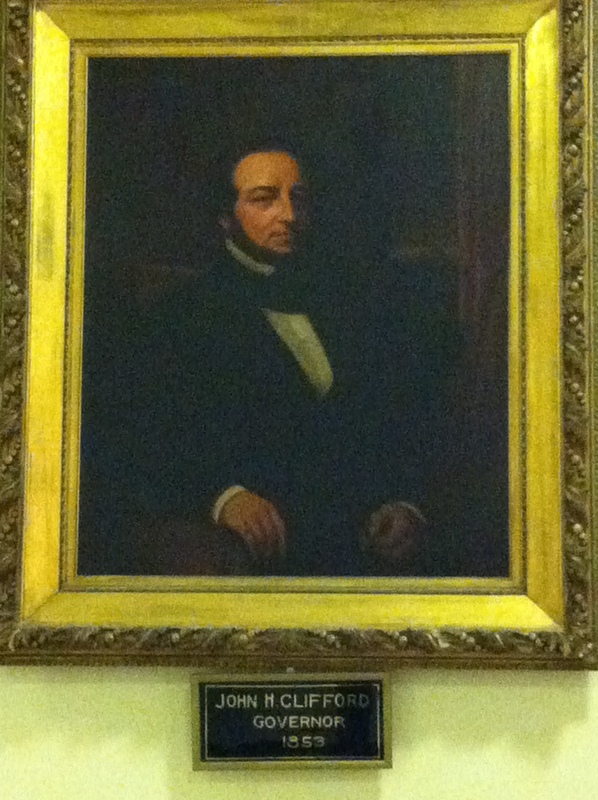 Needless to say, Governor Clifford’s portrait was going to be a very involved job. I performed the normal steps of using a vapor treatment to relax the cupping craquelure, and the entire paint film was consolidated from behind to prevent further flaking from the water damage. Then the canvas was lined onto a sandwich of archival polyester mesh and mylar. The cleaning process went as expected, until I reached the hand. I carefully removed the old retouching, expecting to see the old water-damaged hand beneath it. That’s where my adventure began. 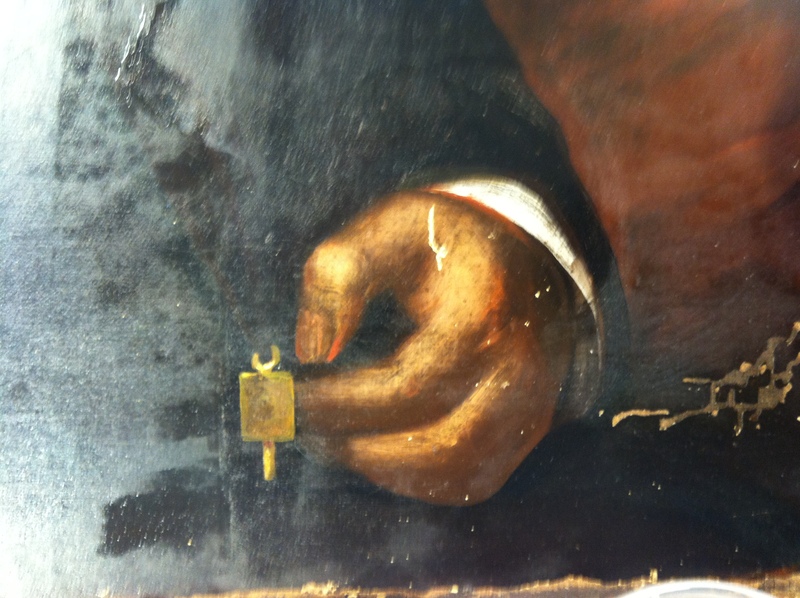 There was not a trace of the old hand, except for the area which had been scrubbed down by the previous restorer! Yuk! Looked like a stump! For a while I considered inventing a hand to fit the pose. The Governor was holding his Phi Beta Kappa key, so I did a quick study to find the hand position which may have been there. 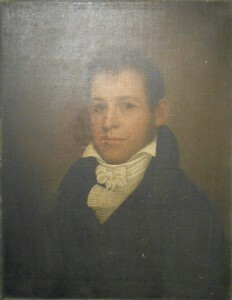 That’s when I remembered that the portrait’s owner had mentioned that this painting may be a copy of one in the Massachusetts State House in Boston. 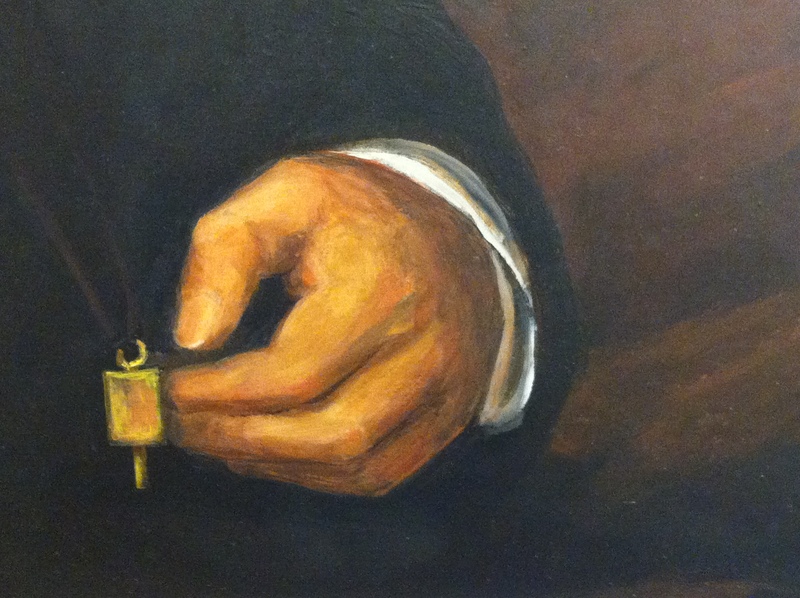 I called the Curator of Collections at the State House, described my project, and asked if Governor Clifford was also holding a key in the State’s portrait, and if I could be emailed an image of the portrait for reference. 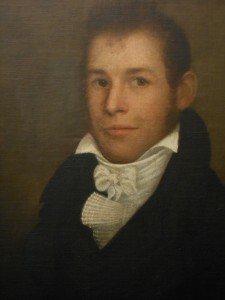 The answer was that the portraits most likely matched, but that the one on display in the Capitol was also in need of cleaning, and the details of the key-holding hand were obscured in their photo. Reference photo of the Governor’s hand in the State House version being used as a reference for replacing the damaged hand. Those photos turned out to be a great resource in replacing the hand. The old retoucher had the right idea for the pose, but just didn’t have the skill to make it believable. The original painting shows that the key is indeed held in an unusual pose. So I started in on the task of reproducing the hand, and painting it in a manner similar to the Governor’s other hand, which is softly rendered and refined. This project was fascinating for me. It was gratifying to see the process yield results, and to know that by not taking the easy route (inventing a new hand) I was helping preserve an historic document in an authentic way. 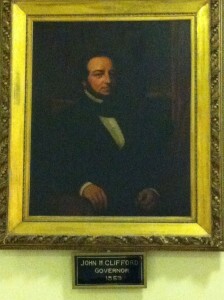 The restored portrait of Governor Clifford. 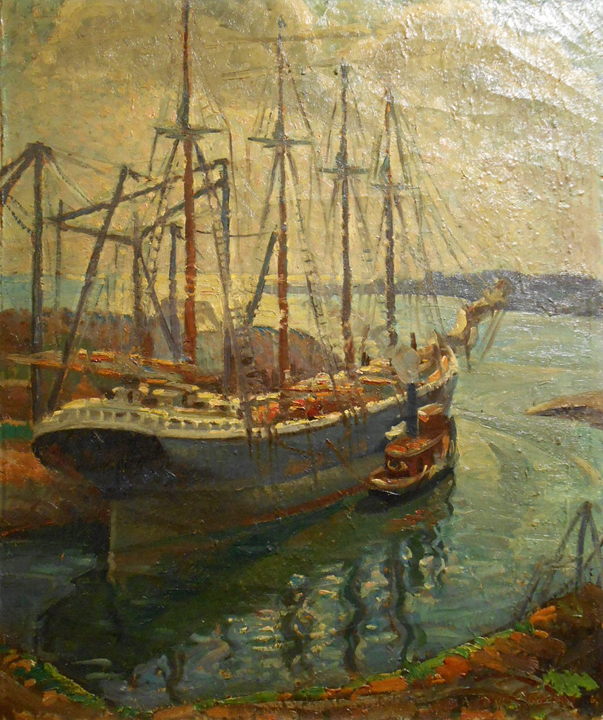 The Cape Ann school of painting has always been a source of inspiration for me. I learned to paint in Gloucester while my family summered there, and the excitement of living in an art colony formed my ideas about painting and artists. 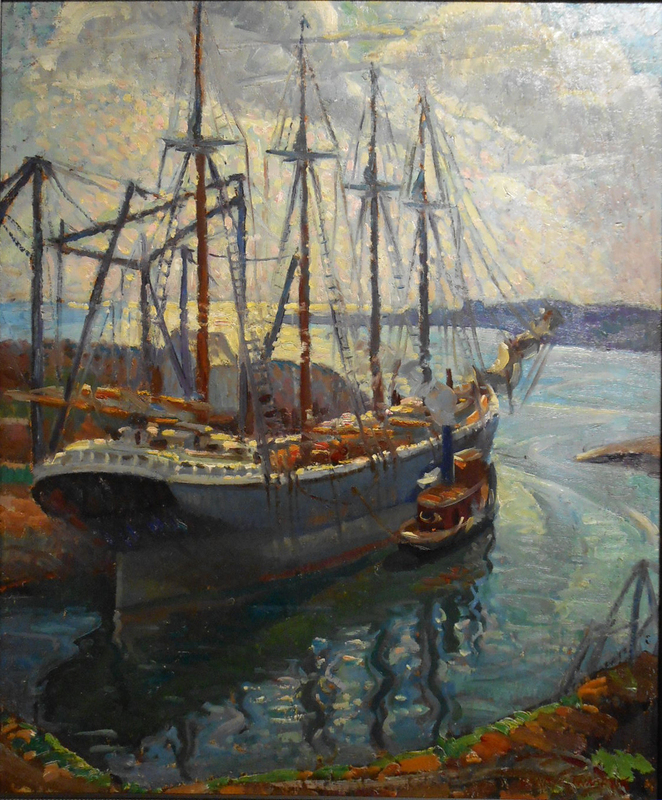 Now that I have several decades of perspective on what empowers the Cape Ann artists, I realize that they successfully blended Impressionism and Realism, and enlivened it with a dynamic sense of composition. What that means is that they loved the physicality of thick, buttery paint, skillfully used complimentary colors, and designed their canvasses to provide an active, energetic visual experience. 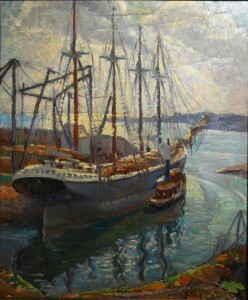 A few months ago I acquired a masterful 1928 Gloucester harbor view by Henryk Francis Twardzik (1900-1992). 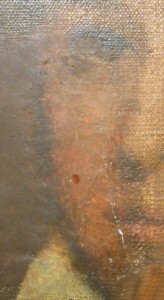 It needed to be cleaned, but it also had some condition issues which required stabilization of the canvas. 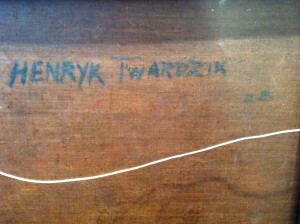 Twardzyk oil painting before cleaning and restoration. Note the large cracks visible in the sky. Similar cracks ran all over the painting, but are not evident in this photo. 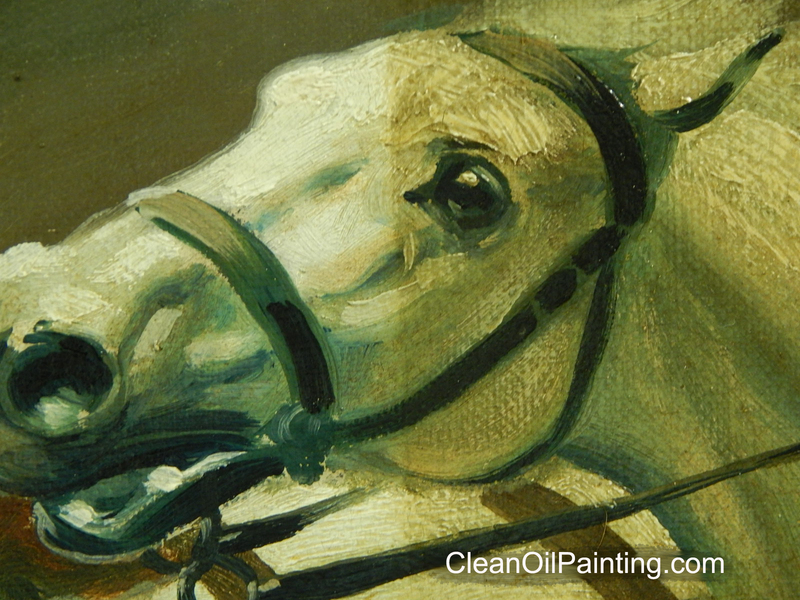 When an oil painting on canvas ages, a pattern of craquelure (cracks) often develops. It shows up as a tracery of fine lines running over the entire surface. 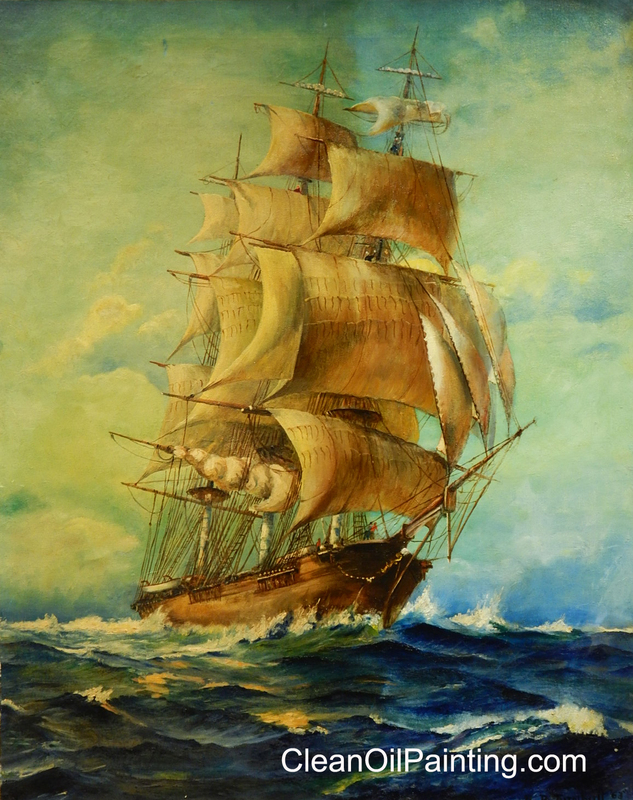 If the canvas is strong and the paint is flat, craquelure is usually stable, and not a problem. 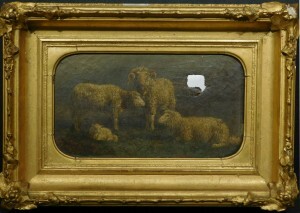 It even adds a desirable antique look to many works. Thick paint with cracks in foreground. 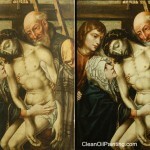 A small paint loss with lifting paint nearby. 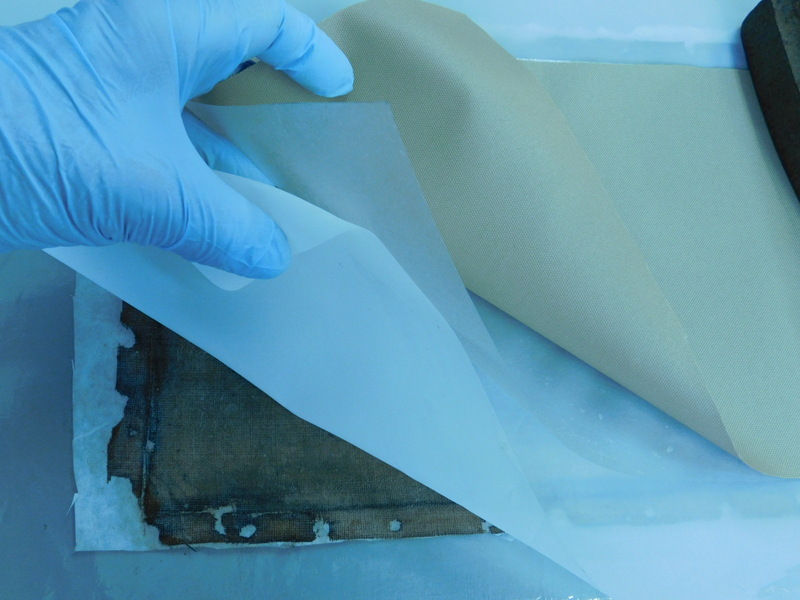 The remedy for this requires two steps: First, a vapor treatment to relax the paint and flatten it, and then lining the painting onto a new support, which is usually a polyester canvas interleaved with a sheet of mylar. 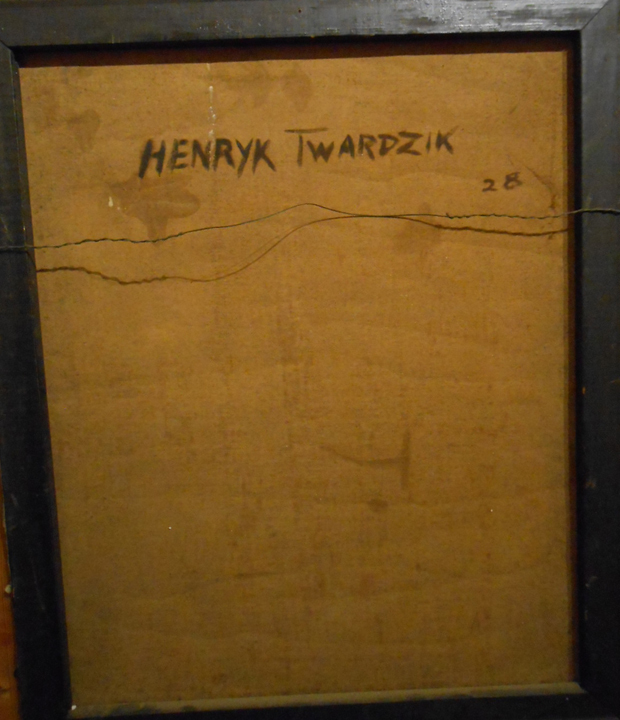 The new lining covers the back of the canvas, and while that is normally not a problem, this painting was signed and dated on the back, and obscuring the artist’s markings would be undesirable. In a smaller, lighter painting I would opt for lining on transparent Mylar, with a translucent polyester mesh layer to reinforce the tacking margins. However, this one measures 30″x25″ and the paint layer makes it as heavy as a much larger painting, requiring a firmer support. Also, the layer of mesh would fuzz-out the strong, crisp signature. I opted for an unusual solution. The heavy-weave canvas needed a good bond to a firm, transparent surface. I decided on a sheet of 1/8″ Plexiglas, and a thick cushion of transparent adhesive to fill the coarse weave and provide full contact with the smooth plexi. 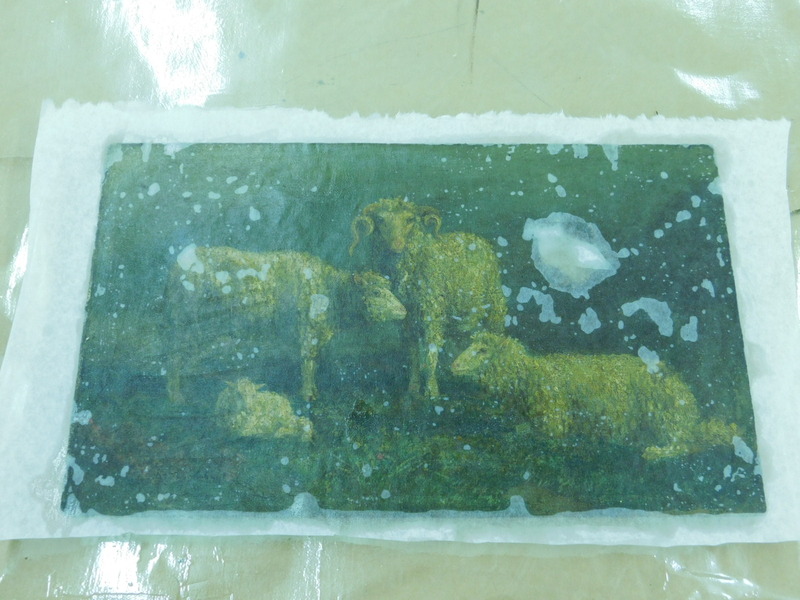 Here is the process used: A diluted solution of the normal mounting glue, Beva 371, (a heat-set liquid) was first applied to the back of the canvas. It soaked in, to fill any cracks in the painting ground. It also penetrated into the larger cracks in the paint. (This is referred to as consolidating the paint layer.) 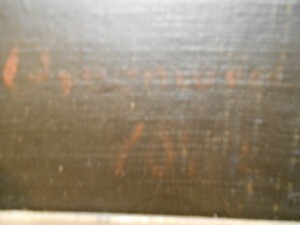 The next day, after that dried, a normal coating of Beva 371 was added to the back of the canvas. 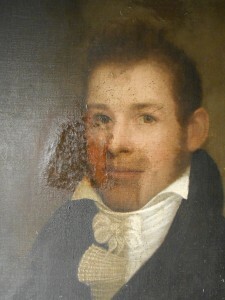 The Plexiglass was sanded on the side to face the painting. After another day of drying, several sheets of Fusion 4000 (a heat-melt adhesive) were added to the back of the canvas. Note: The Beva melts at a lower temperature than Fusion 4000, The two adhesives have different properties when they are set. The Fusion 4000 becomes a flexible and waterproof sheet of archival plastic, providing a barrier between the plexi and the painting. The Beva remains flexible, but not uniformly solid. 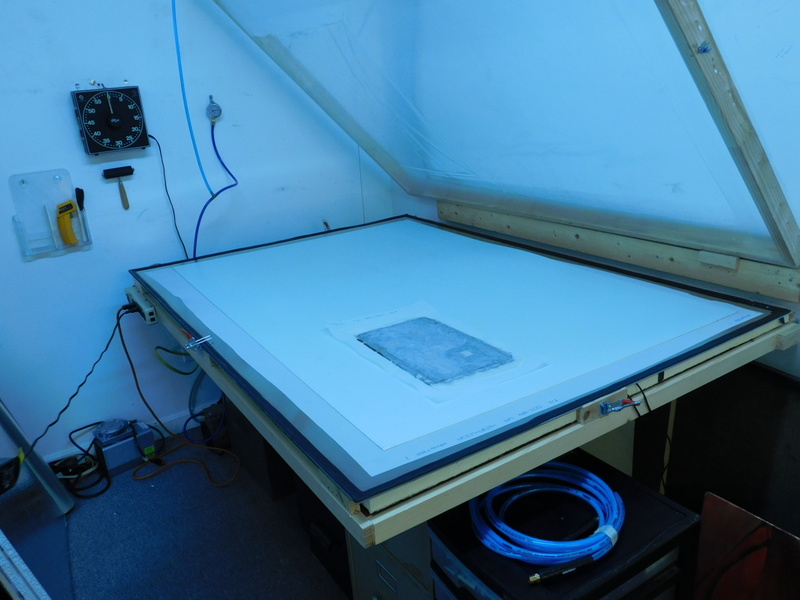 The Fusion 4000 forms to the contours of the canvas and the sanded plexi before setting. The Beva provides a barrier which prevents the Fusion 4000 from fully bonding with the canvas fibers, making removal of the Fusion 4000 easier if needed. A layer of polyester mesh was cut to overlap the tacking margins. 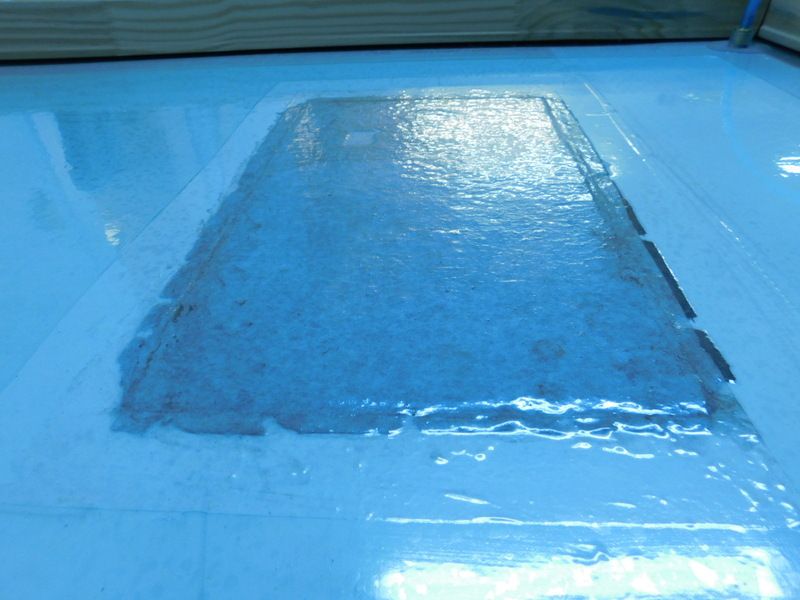 The center of the mesh was removed so that only about 1/16″ around the edges would be covered by the plexi sheet. Once all the pieces were assembled, everything was tacked in place with a hot iron. Then it was placed into a vacuum table, the air evacuated, and the temperature brought up to melt the adhesives. After the bonding, the heat was turned off and the painting cooled for about an hour in the vacuum. Twardzyk painting being cleaned. Note the new white polyester mesh extending beyond the margins. After lining, the painting was cleaned. Luckily, only one small paint loss needed to be in-painted. A clear, non-yellowing varnish brought out all the colors. When dry, the painting went back into the spray booth and the plexi received a coating of mat varnish, to make the view of the canvas beneath look like it was unlined. The new polyester mesh edges were tacked back onto the original stretcher, and a protective backing was cut to fit, with a window opening to show the signature and date. 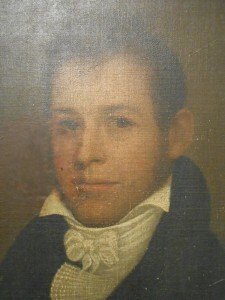 After cleaning and restoration of the oil painting.